Review date: 28 May 2004. "Tactical" flashlights are a special breed. They're generally stubby little things, wider than a standard 2-AA-cell light, but not as long. They generally also have a chunky, brutal, knurled-and-finned appearance that tells you they're meant to be used by people whose daily activities may involve a certain amount of killing. The important thing about tactical lights is that they're really, really bright. All tactical lights sacrifice battery life for the ability to see things much further away than you'd expect from such a small light. And then there are the truly insanely bright ones, which aren't just useful for seeing people, but can also be employed to make sure those people don't, themselves, see anything but purple blobs for the next several minutes. Tactical lights almost always have a pushbutton switch on the end of the light, so you can hold them in your fist with your thumb on the switch for easy momentary blasting, or amuse yourself with various macho cross-wristed flashlight-and-gun poses. Tactical lights, in other words, look like this. 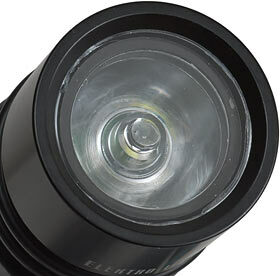 This is Elektro Lumens' XM-2 flashlight. Like every other light Elektro Lumens make, it has an LED lamp, instead of the incandescent globe lamps that most tactical lights still use. The LED in this light is Lumileds' redoubtable three watt Luxeon Star, as seen in the bigger FT-3C light I reviewed the other day. Unlike the three-C-cell FT-3C, though, the XM-2's quite small. It's about 12.5cm (five inches) long, and with batteries it weighs about 146 grams (5.15 ounces). It's 32mm (1.3 inches) wide at its widest point - the octagonal ring behind the lamp assembly, which is there to stop the light from rolling. 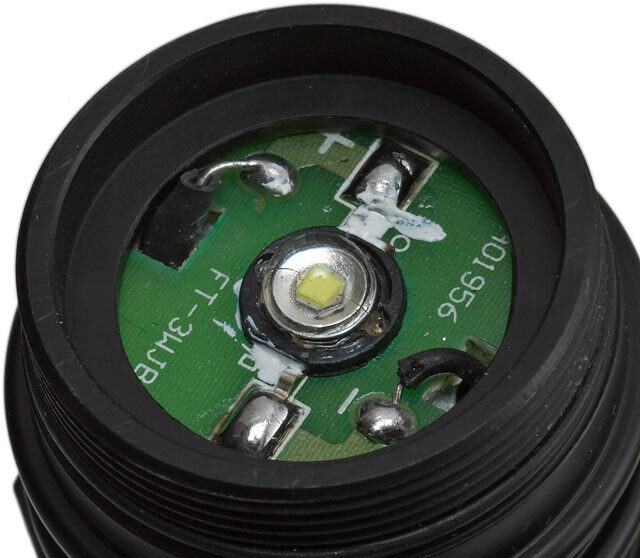 The original one-watt-nominal Luxeon LEDs outshine many low end flashlight bulbs; they can mix it with medium-power incandescents if they're well cooled and driven at more than their rated power. The FT-3C proved to me that the "three watt" Stars work the same way, and can be pushed to something like twice their nominal power, for output that most large incandescent-bulb lights can't match. There's no way the LEDs will last as long as they're meant to when treated this way - but they're meant to last for tens of thousands of hours before dropping to even 80% of their initial brightness, so lamp life still ought not to be an issue. All white LED flashlights emit nicer light than all but the fanciest incandescent-bulb lights; white LED light is smooth and blue-white, so at a given brightness level it does a better job of lighting stuff up than the same brightness level of uneven, yellowish incandescent light. But these new high-wattage Luxeons let LED flashlights deliver just plain more light than most incandescents can manage, too. 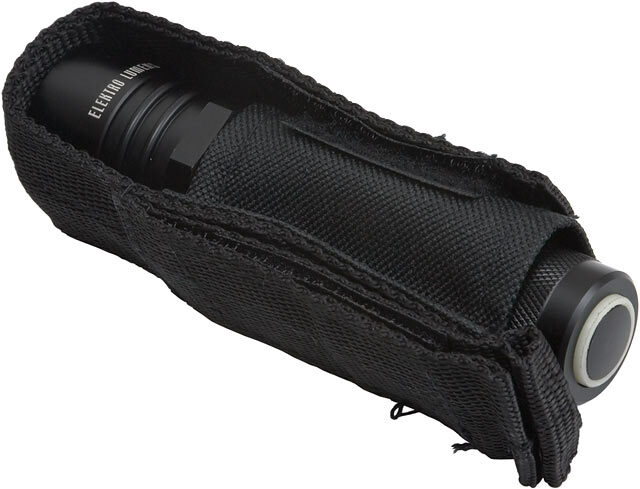 Elektro Lumens sell the XM-2 for $US59.99, ex shipping, batteries not included. If you shop poorly, the batteries can increase the price considerably, because they're a pair of little CR123 lithium photo cells - the standard power source for tactical lights. A typical brand-name alkaline AA these days (PDF datasheet here) is nominal-1.5-volt, with a capacity of some 2.7 amp-hours into a gentle 25mA load (rather a lot less, into the much stiffer load of a flashlight). That's about four watt-hours of energy, from a cell weight of about 23 grams. 5.75 grams per watt-hour. A CR123, on the other hand (PDF datasheet here) is three volt nominal, with a capacity of 1.5Ah or so into a hundred ohm load, which means it'll be starting out with about 30mA current, dwindling as the cell voltage falls. This load is in the same ballpark as a flat 25mA, and adds up to 4.5 watt-hours. CR123s only weigh about 17 grams, so that's a mere 3.8 grams per watt-hour. This superior energy density, and the fact that CR123s can deliver more current without complaint than alkalines (they also contain automatic thermal circuit breakers to protect them from overheating if they're worked really hard), explains why tactical lights all use these things. If you buy a couple of CR123s at a pharmacy, camera store or unenlightened electronics store you'll probably pay several US dollars a cell - $US7.99 from Radio Shack, $AU12 or more here in Australia. From more sensible dealers, though (many of whom await your attention on eBay), the price for off-brand CR123s in moderate quantities stands at about $US1 apiece. Off-brand CR123s are usually nearly as good as brand name ones, and have the same monstrous shelf life - all lithium batteries retain most of their capacity after ten years on the shelf, and will probably be better than nothing for quite a lot longer. So you might as well buy ten CR123s on the cheap, rather than two at rip-off prices. So. Sixty US bucks for the flashlight, plus another couple of bucks for the batteries, plus delivery. What do you get for your money? Well, you get this nifty hook-and-loop-closure belt holster, for a start. It's a little uneven around the edges, but it's solidly made, and has both a permanent stitched belt loop and a tear-away one on its back. You can see the XM-2's tailcap switch sticking out of the end of the holster, here. That's not an ideal situation, if you manage to jam it up against something, perhaps when sitting in a chair. The switch itself, though, is simple and robust. 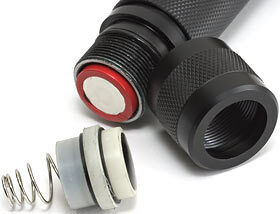 It's also not quite as nice to use as tactical light aficionados might like, because it's merely a plastic insert with a spring on it, set in a threaded tailcap which you can tighten all the way down to turn the light on constantly. The plastic button only gives you momentary operation. Here's the tailcap disassembled. If you find the switch a bit too touchy, Elektro Lumens recommend you pop out the spring and stretch it. I tried that, and it did firm things up a bit, making it easier to screw the cap almost all the way down and still get positive switch action. The clicky switch on my Arc-LS is still a lot more pleasant than the simple XM-2 arrangement, but then again the XM-2 has no mechanical parts that can fail, so I feel no urge to engage in further switch twiddling. Both ends of the XM-2 are sealed with rubber O-rings, and there's a rubber seal on the back of the switch as well. You can't help but break the seal when you push on the switch, so this light doesn't really count as fully waterproof, but it's close enough for most people. It should tolerate being dropped in water, and any amount of rain, with no trouble. The lamp end of my review XM-2 is straight and clear enough, but not very neatly finished; there are little chips and spots and inclusions around the lens that sits on top of the LED. The lens itself works perfectly well, but this flashlight has clearly not been painstakingly crafted by skilled artisans. The FT-3C has this same problem; functionally OK (including the same sort of switch), physically solid, but aesthetically questionable. Apparently, this is because Elektro Lumens have farmed out production of these lights to a cheap and cheerful outfit in Taiwan, rather than using the bespoke manufactory that produced their bigger, dimmer, but much slicker Blaster III. Eh. It works. I can live with it. Here's the LED itself, revealed by unscrewing the lens end of the lamp assembly. The white goop is stray thermal grease, squidged through from the contact area between the LED and its essential heat sink. The extra grease is mildly unsightly, but it does no harm. Like the other Elektro Lumens lights I've reviewed, this one has no fancy microprocessor control or regulation hardware - just some minimal current control resistance (the importance of which I explain in my old tutorial here) in series with the LED and the batteries. So this light's brightness will drop in direct relation to its battery condition - but that's not as much of a problem as it is with incandescent flashlights, because LEDs produce useful light even when their supply voltage is greatly reduced, instead of sliding down the spectrum into useless infra-red. The XM-2's LED hauled a couple of brand new cheapie CR123s down from their resting voltage of about 6.6V between them to a mere 3.8V across the lamp; that fell off rapidly as the batteries came to terms with the roughly one amp current the lamp demands from fresh cells. This is significantly less power than the FT-3C pulls from its three C cells, but it's still a lot. At one metre, the middle of the XM-2's beam managed about 900 lux on my light meter - very impressive, considering that the flashlight's central bright spot was about 20cm across at that distance, smoothly falling off into a useful spill an easy metre wide. You can't change the focus of this light, but its standard beam is an excellent compromise between a narrow "possum spotting" setting and a super-wide path light. The XM-2's brightness isn't amazing, for this kind of flashlight. 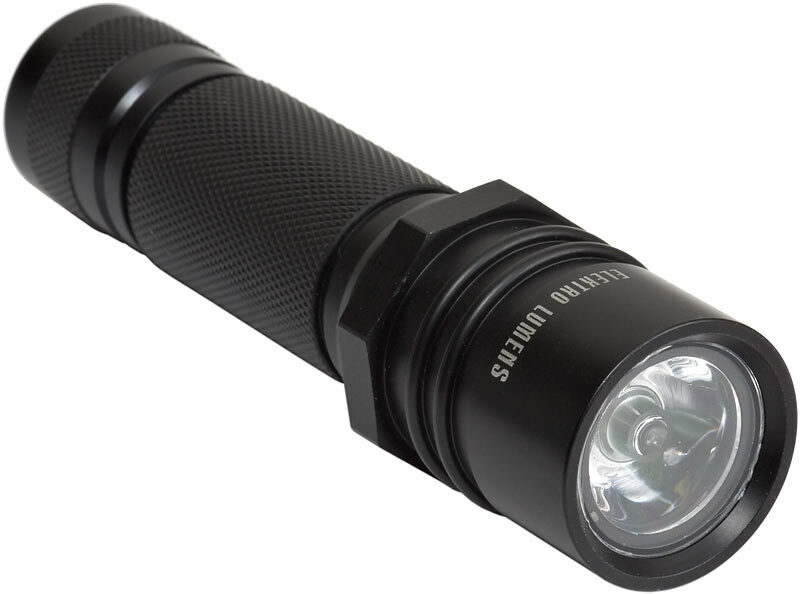 SureFire (the biggest tactical light brand) make several brighter incandescent lights, and there are lots of lights with narrower beams that more brightly light the smaller area they illuminate. Elektro Lumens' own Blaster III, for instance, can focus down to a very tight beam with better than four times the XM-2's brightness, despite having only about a third as much lamp power. For most people's purposes, though, the XM-2 is an excellent light - and its not-totally-stunning brightness means it ought to get around two hours of bright light from a couple of CR123s. And after that, there'll be many more hours of dwindling light. For its size, the XM-2's a very impressive package. Here it is (in the front row) compared with some other high performance lights. There's a AA and a CR123 battery in the bottom left corner; behind them is a CMG Reactor, which I reviewed along with the Blaster III, which is the big green light at the back. The silver one's the FT-3C; the stubby one at the right is an Arc-LS, and the teeny one in the middle of the group's an Arc-AAA Limited Edition. The XM-2's little enough that you can, in a pinch, carry it in a pocket. A front pocket in non-tight jeans, yes, but a pocket nonetheless. It's got more than twice the brightness of the Arc-LS (which runs from one CR123, and costs a lot more than the XM-2), it's very solidly constructed (and, unlike the FT-3C, its batteries don't rattle), and it's not ridiculously expensive. There are lots of 1W Luxeon Star flashlights around these days, but not many 3Ws, and the FT-3C's pretty darn cheap for what you get. It's reasonably cheap to run, too, as long as you know where to buy your CR123s. Accordingly, the XM-2 gets a Recommended from me. Now, I'm off to play with it some more. Review flashlight kindly provided by Elektro Lumens. Plain old C cells drive the same lamp harder in this light.